Seoul’s military procurement agency has announced that Airbus beat out Boeing for a $1.33B contract to supply air refueling tankers to South Korea. Airbus Defense and Space will supply four A330 MRTT aircraft by 2019 to South Korea’s air force as part of the 1.488 trillion won deal. 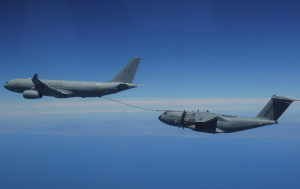 The state agency added that the A330 MRTT was selected over Boeing’s KC-46A because of its price, performance, and ability to carry a large amount of personnel and cargo.